Follow Spirit Xtreme on Facebook, Instagram, and Twitter for the latest Xtreme updates! 10/20/2017 - Host a Party at Xtreme! Let us take your PARTY to the XTREME! Personally customize with one of our 3 packages! Each package includes: tables, chairs, and bottled water (1 per athlete). You provide: Cake, candles, drinks (other than water), and decorations. Includes: 25 guest limit (additional guests can be added for $10 per guest), 1 1/2 supervised gym time, 30 minutes in the party area, 5 Large pizzas (your choice), "Add On" option included with price of party. Saturdays: 10:00-12:00p.m., 1:00-3:00p.m., 4:00-6:00p.m., 6:30-8:30p.m. 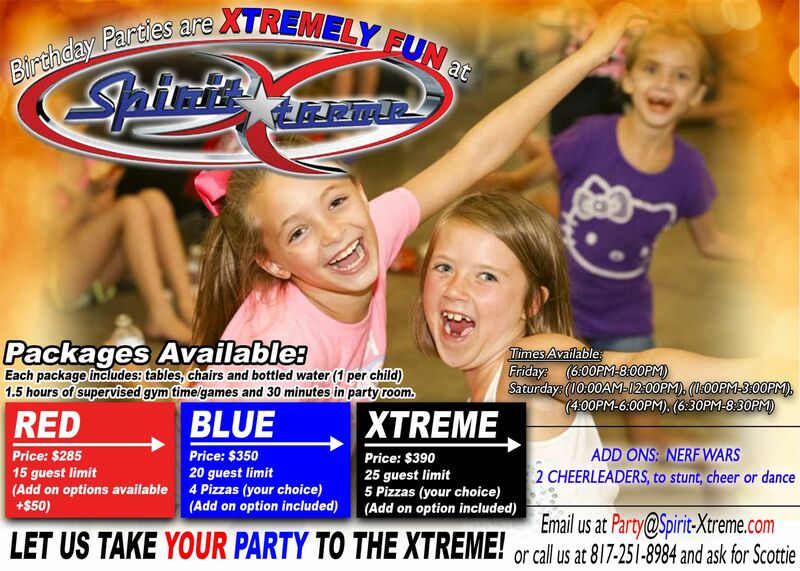 Email us TODAY at party@spirit-xtreme.com or call us at 817-251-8984 and ask for Coach Scottie! Host a Party at Xtreme!